Written by admin on January 20th, 2019 January 20th, 2019 . Written by admin on November 30th, 2018 November 30th, 2018 . This years walk has been cancelled account of impending rain approaching during the event. Much work went into the preparation but mother nature had other ideas. he has pulled off great Spirit walks over many years. Written by admin on January 10th, 2018 January 10th, 2018 . The annual club dinner will be at the Wayside Dining Lounge on Saturday, January 20th. We will meet at the restaurant at 5 pm for some socializing. Everyone will be able to order off the menu or enjoy their prime rib buffet. We hope to see you all out for this social event. Please let any of the executive know if you are planning to attend by the eighteenth. Written by admin on November 11th, 2017 November 11th, 2017 . Come and join us on a starry night walk thru a candlelit woods enjoying the performances. This event has been organized for many years by Brian Wilsdon and we as volunteers appreciate all he has done and continues to do to make this event a success. Hope to see you out this year, enjoying the carols. Dutton Dunwich Trans Canada Trail Celebration. The trail is now 93% complete and some 22,000 kms long going through 13 provinces and territories. The Great Trail is comprised of 432 individual trail sections of which the Dutton Dunwich trail is one. There is The Great Trail app for IOS and Android designed in partnership with ESRI Canada. Everyone is invited to celebrate the near completion of the Trans Canada Trail with a hike on August 26th. It would be awesome if we had a real good representation from the club. Long time member Marg Hulls will be leading the hike with a barbecue to follow. Information in poster above and a nice article in the St. Thomas Times Journal last Friday. The first 75 registrants will receive a commemorative embroidered badge. Written by admin on March 2nd, 2017 October 14th, 2017 . Avril and DJ aka The Canadian Flowers in front of the Shrine to St. James. 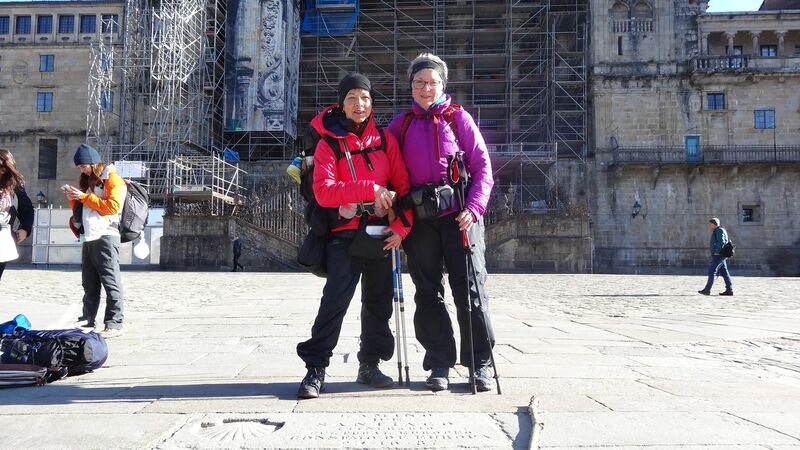 Be sure to attend our AGM and hear about the adventures of club members Avril and DJ as they relay the story of their journey to Santiago this January. The event is held in the Carnegie Room of the St. Thomas Public Library, 153 Curtis St. Doors open at 6:30pm and business meeting starts at 7pm, then the Way presentation. You will be able to renew your membership or new members may sign up at meeting. There are open positions on the executive available, talk to any current executive if you are interested in joining. Look forward to seeing you all their. 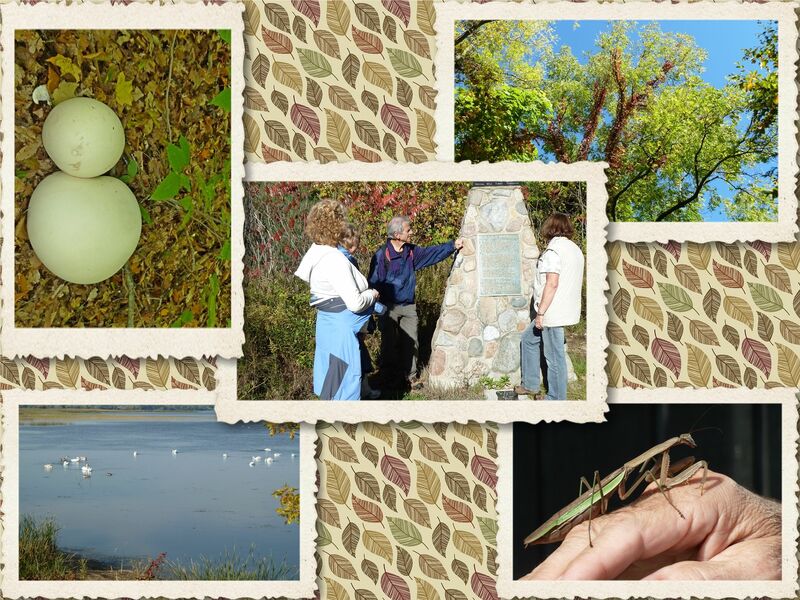 The annual dinner for the Elgin Hiking Trail Club is at 5 pm on Saturday, January 21st. Please let any executive member you are planning to join us. We look forward to seeing you there for a great meal and social hour. DJ will not be able to join us she is backpacking the El Camino in Spain. 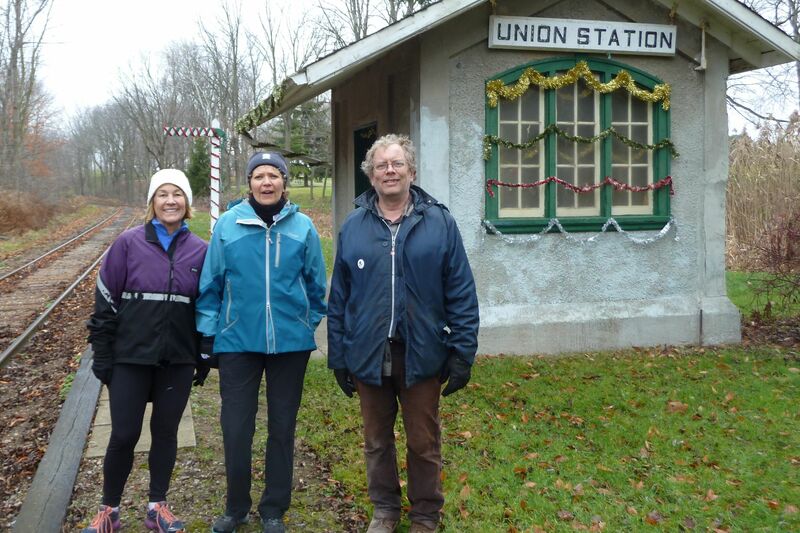 Wendy, Phyllis and Tom at Santa’s way station in Union. We had a total of 15 people out for the fall end-to-end. Four people completed the whole trail with new member Joan being one of them. Congratulations Joan. We had three regular hikers miss the first hike which was cut short due to rain. The rain make up hike was also poorly attended due to slippery conditions. The trail was in pretty good condition and everyone enjoyed themselves. We saw a buck on second hike. Nine new people jointed us on at least one of the hikes and we hope to see them out on our winter hikes. Thank you to all who came out and made the hikes so enjoyable. Written by admin on November 9th, 2016 October 14th, 2017 . 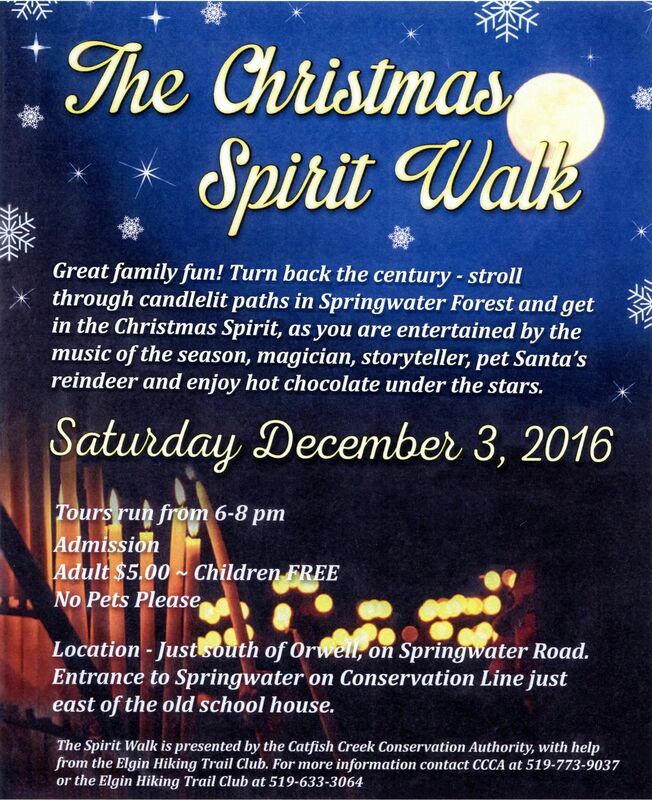 The annual Spirit Walk in coordination with Catfish Creek Conservation Authority is the first Saturday in December. Bring your children and follow the candles for an evening of caroling, magic and visit with Santa in the forest. Hot chocolate, apple cider and cookies will be available for all to enjoy. Hoping for mild weather.